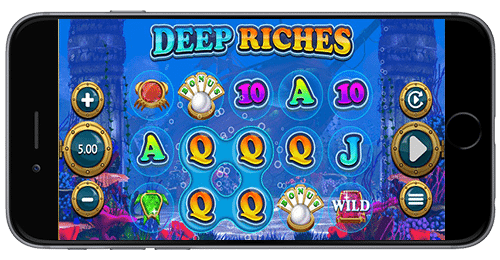 Deep Riches is an underwater-themed phone slots bonus game developed by Core Gaming. There is a Reef Bonus Feature as well as a Special Floating symbol feature. This mobile slot comes with 20 active paylines and a betting range of between 20p and £100 for each spin. There is a free spins bonus feature in which floating wilds to boost your wins are added and frozen on the reels. Continue reading to learn a bit more about this video slot. 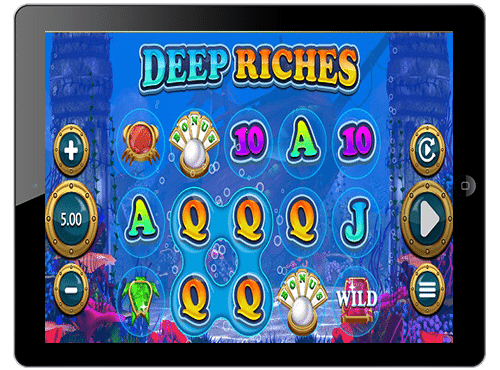 With Deep Riches, you have an underwater themed mobile slot with 5 reels and 20 active paylines. The symbols can be seen floating on the reels when you click on the Spin button. However, you will need to place your bets first and foremost with the minimum betting limit being 20p while the maximum betting limit is £100. The backdrop of this phone slots bonus game comprises of a scene of what is supposedly the lost city of Atlantis underwater. The reels are set against pillars of the sunken ancient city. You can see plankton and other sea creatures on the ocean bed in this bubbly video slot. The graphic design, as well as animation, are sharp, bright and very glossy. On the reels, you have the regular playing card symbols of A, K, J, Q, 9 and 10 as well as theme-related high-value symbols. One nice trick in this phone slots bonus game is that the symbols float upwards on the reels. The playing card symbols are the low-value icons floating on the reels while the high-value icons include: crabs, turtles, a trident and gemstones. There is also a purple star symbol which will earn you a multiplier of 25x your staked sum when you land five of the symbol on an active payline. You will also earn a 25x multiplier when you land five Wild symbols on an active payline. The Wild symbol will substitute other icons on the reels apart from the Pearl Scatter bonus symbol. On this phone slots bonus game, you have Special Floating Symbols which float onto the five reels from the right side. The special floating symbols will float across the reels moving from one reel to the other until the symbols reach the last reel on the left. There is a Wild Water Feature that is randomly activated. If this feature becomes activated the special floating symbols will turn Wild thereby increasing your opportunities of landing combo wins. There is also a Reef Bonus Feature that is activated by landing at least three Pearl Scatter bonus symbols in view on the reels. Here you will have to choose one out of three shells displayed to determine the number of free spins you have earned. The free spins are played on a new reel set located towards the surface of the ocean. You will a giant net on the left side of the reels with wild symbols floating across the reels during each of the free spins awarded. The giant net will retain the wild symbols on the reels instead of them falling off the reels when they get to the leftmost reel. The wilds are held in place for the entire duration of the free spins. This is a phone slots bonus with a lot of promise for huge payouts. It is fun playing and comes with realistic underwater sound effects. The bonus features will boost your chances of landing combo wins.